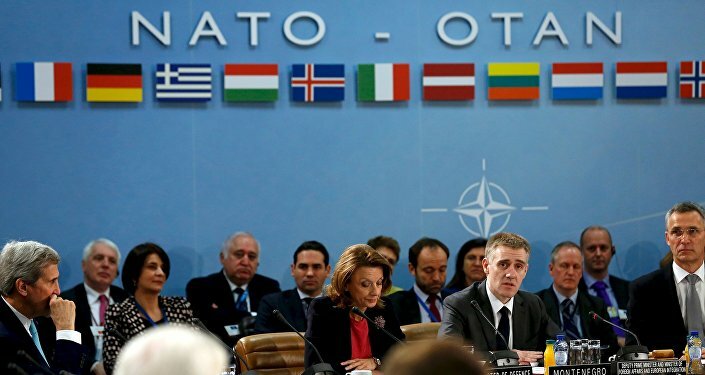 Italian journalist Giampaolo Rossi asks why, amid a unifying global war against Daesh terrorism, NATO has decided to absorb tiny Montenegro; a move which is sure to provoke Moscow. In his impassioned op-ed, published by Milan-based daily newspaper il Giornale and translated by the foreign news portal WhatTheySayAboutUSA.com, Rossi asks why it is that the Western alliance's top commanders have decided now, in the middle of the war against Daesh, is the best time to continue the alliance's eastward expansion. Recalling NATO's decision, made earlier this month, to invite Montenegro to become the 29th member of the alliance, the journalist noted that Moscow's inevitable response was to see the "invitation as a slight which confirms all their suspicions of the West's expansionist agenda –including in the Balkans." "It would be interesting to know," Rossi pondered, "why NATO has chosen this particular moment to provoke aggression with Moscow? Surely NATO's top commanders don't assess the NATO accession of a tiny Balkan nation as a greater priority than good relations with Moscow – whose support is vital in the struggle against the Islamic State, which President Obama himself has named a 'common enemy'?" All About Balkans: Why Montenegro's Membership Would Be 'Huge Win' for NATO? The situation is especially confusing, the journalist suggested, given that "Montenegro has been on the NATO waiting-list for ten years, with public opinion there far from united on the idea of joining NATO, resulting in continuous propaganda campaigns for joining the alliance, (paid for with NATO cash)." The expansion, Rossi warns, "comes at a time when there is already heightened tension between Russia and the West. Several days ago Turkey – a member of the NATO alliance, shot down a Russian warplane, which could have triggered a cycle of retaliation; it was only thanks to cool heads in the Kremlin that an international crisis was avoided. The result of a visit by French President Francois Hollande to Moscow [served as] the recognition of the role Russia is playing in Syria against Daesh, along with increased willingness from the West to coordinate its operations with those of the Kremlin." "But now," the journalist lamented, the decision over Montenegro "threatens a fresh divide. One gets the sense that there is somebody within the Western alliance pulling all the stops to wreck relations with Moscow." Rossi recalled that in a recent, widely-publicized interview, NATO Secretary Jens Stoltenberg — "the mastermind of the entire Montenegro deal – made vicious allegations against Russia. Stoltenberg claimed that Russia is a threat to security throughout the whole of Europe – on the grounds of its aggressive policies directed at Ukraine, and its military build-up, 'which hits an extreme which we have not seen since the end of the Cold War.'" 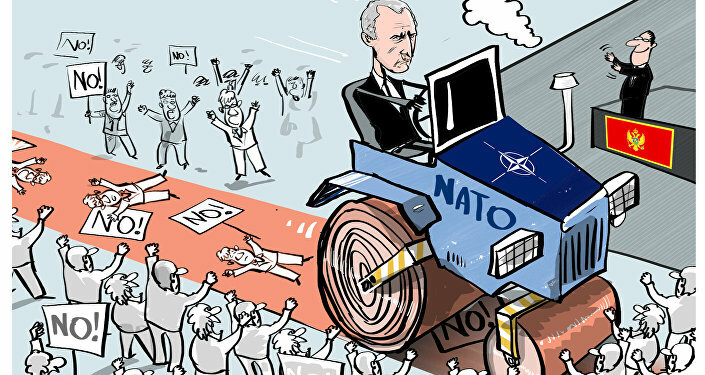 "But how sure are we that this stereotype of a threatening Russia – and of a NATO which is trying to save its members from the rampaging 'bear from the East', corresponds with reality? Or could it just be a justification for Western expansionist policies, with Washington in the driver's seat?" "A realistic view," Rossi argues, is making it "clearer and clearer that there is an ongoing encirclement of Russia by the West, which Russia responds to with attempts to safeguard its own territories. The crisis in Ukraine can also be viewed in this light." Moreover, according to the journalist, a simple assessment "of the military might of the opposing parties" shows "that Russia's military power today is only one-fifth of what the old USSR could have mustered –whilst NATO has enormously augmented its offensive (sorry, 'defensive') arsenals over the last twenty years, gobbling up the countries of the former Warsaw Pact and neighboring neutral countries in the process." "If we look at military expenditure, the US spends eight times more on its military than Russia. And, according to the International Institute for Strategic Research, in 2014 the NATO nations poured over $800 billion into defense spending –compared with the less than $70 billion spent by Russia." "To fully comprehend the deranged nature of Western thinking, we need only refer to an article which appeared in La Stampa a few months back – in which the authors suggested that Russia is not only getting ready to attack all of Europe, but that it will be doing so with less than half of NATO's military forces. Maybe we should just assume that Russia is set on a path of suicide…"
Rossi recalled that the only area where Russia is on a par with NATO is in its nuclear capabilities, possessing "as the USA does, the so-called nuclear 'triad' – an arsenal capable of being deployed simultaneously in three different areas –on land, by air, and at sea." "The last year," the journalist cautioned, "has seen the highest tensions between Washington and Moscow since the Cold War," with the Ukrainian crisis giving the US and its allies "a pretext for the mass deployment of military forces in Eastern Europe and the Baltic states." With both sides upping the ante, carrying out massive military exercises and repeatedly accusing one another of flying military aircraft and sailing fighting ships close to each other's borders, Rossi emphasized that ultimately, "what is happening is not in Europe's interests – and not in Russia's interests either. On the contrary, both Europe and Russia need to build on a joint security understanding and integration. Many challenges, from terrorism, to the economic crisis, to energy issues, to finding balance in the Middle Eastern, are common challenges." "So who is fanning the flames? Who is interested in driving a wedge between Russia and Europe? Who is pouring oil on the gathering flames? Maybe we should look toward Washington for the answers," Rossi concluded. All About Balkans: Why Montenegro's Membership Would Be Huge Win for NATO?